A giant red arrow? Was this game designed with MS Paint? Seriously, a giant red clipart shaped arrow! We’ll get back to that later. This is the “new” release from TAITO in their series of bubble busting games that is unimaginatively named, New Bust-A-Move. Yes, New as in not old, although perhaps it should have been named something more along the lines of “Crappy Bust-A-Move”, yes that name would much better suite it. I’m a huge fan of Bust-A-Move and was really excited so I jumped right in and grabbed this one. What a mistake that was. If you’ve already seen, own, or have heard of Bust-A-Move for the iPhone, let me warn you, this game is not the one you need to be buying. The original Bust-A-Move game is the good one. This new version is something you should stay far away from. Here’s why. For starters, the graphics are seriously awful and you have to tap everything twice to do anything. The game menus are giant large boxes with plain text, lacking anything that would suggest the development team cared about their work. Seriously, it looks like an outsource job, if it was sent to be done by a team of elementary school kids using MS Paint. So menus are fine, right but wait, when you play the game, a GIANT RED ARROW is always on the screen to HELP you AIM. You can’t get rid of it, it won’t go away after a few levels. It is always there. 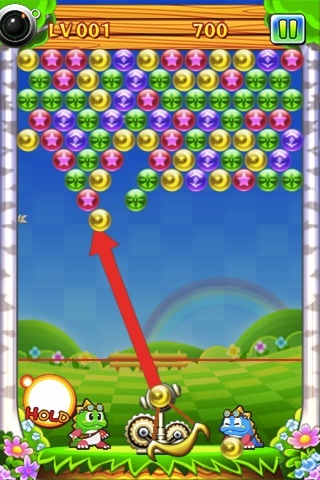 The arrow is perhaps the most atrocious thing I’ve ever seen in an iPhone game developed by any company, large or small. Another major issue is how easy it is to cheat the game. If having that giant red arrow wasn’t bad enough, you can also just tap on where you want the ball to go, instead of aiming your slingshot. The gameplay is like any other bust-a-move game. The original 2D bankshot shooter match-3 with levels. There are over a dozen new “special” type bubbles in this version, each with their own powers. The one thing I like better about this version is that they’ve made the playing area look larger, removing some of the box graphics surrounding the play. The game uses plain old Times fonts. Not a big deal, but it sure is ugly. A few new features are worth mentioning. One new feature is the Hold area. If you can’t use a bubble, you can tap hold and keep it for use later. There’s also a flying creature who comes and adds more bubbles once in a while, which encourages you to play faster. Another new thing is the moving stack of bubbles. In some levels all the bubbles are being held up by a flying bird and the entire stack is swaying slowly in the air, making aiming a bit more difficult. But don’t worry you have that GIANT RED ARROW helping you along the way, like it or not. There is now also a key bubble that you are are to not drop. Star bubbles erase all bubbles of the same color. Line Bombs and Metal bubbles have cannonball destructive effects, and there are also bosses to defeat throughout the game. 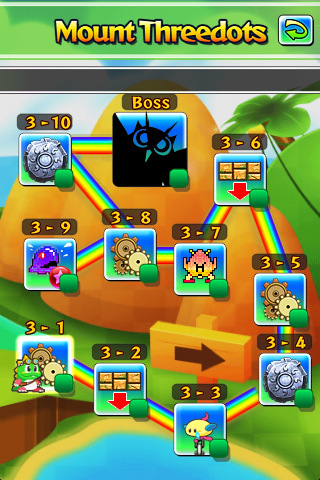 You can play in the adventure mode going from island to island moving through stages, or play in endless mode. Game Center is integrated in. Overall, the game has a lot of new material, and has potential to be good, although it is super annoying having to deal with that red arrow. Until they remove that my advice is to stay clear and go with the original. AppSafari review of New Bust-A-Move was written by Joe Seifi on February 7th, 2011 and categorized under App Store, Games, Puzzler, Resource Management. Page viewed 4658 times, 1 so far today. Need help on using these apps? Please read the Help Page.